Beth & Cory's Mom: How Many Books Do You Read? I saw this on Facebook the other day, a graph that breaks down the percentages of U.S. adults who have read NO books in the last 12 months, read 1 to 11 books, and read 12 or more books. I usually look for something like this when I post my book lists every year, just to see where I fit into the average. Usually I can't find any real information about how many books the average person reads in a year, and this one doesn't really help with that, either because it doesn't really count anything over 12, which is still quite low. That would be one book a month. One. 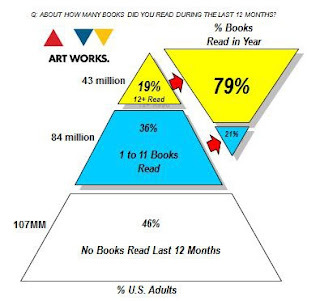 According to this graph, 19% of U.S. adults read 79% of the books read in one year. A small 21% read at least one book, and the rest of the adult population just does not read. I don't know how this information was collected, but it makes me really sad that almost half of American adults read absolutely NO books in the last year. I understand that not everyone loves reading - hard to imagine, but obviously true - but how can they not even read one book?